The Plant-Based Pharmacist's Blog: Defend Yourself! We use a variety of gear to prevent injury. A motorcyclist wears glasses and a helmet to protect their eyes and head. Construction workers wear steel-toe shoes and hard hats. Potholders are used in the kitchen to grab something hot. What is needed within our bodies to protect us from disease? Plants. Yes, that’s correct. Amazingly, nature has built into plants the ability for them to produce compounds for them to fight disease. When we eat the plants – vegetables and fruits – the same plant compounds fight disease in us. It is a natural process. As our body metabolizes oxygen, some cells will become altered and become free radicals. When this occurs, the free radicals cause a damaging chain reaction to our DNA, resulting in loss of the DNA’s function of giving instructions to cells of what to do. Smoking will accelerate this process. The result of this cell damage is many diseases including heart disease, stroke, cancer, rheumatoid arthritis, Alzheimer’s, Parkinson’s disease, COPD, diabetes, and premature aging. The antioxidants found in vegetables and fruits will fight to neutralize the free radicals. Nature’s antioxidant warriors make a perfect combination of lycopene, beta-carotene, vitamins A, C, and E, minerals zinc and selenium, and a host of phyochemicals to win the battle. A vitamin pill will not have the same antioxidant properties. 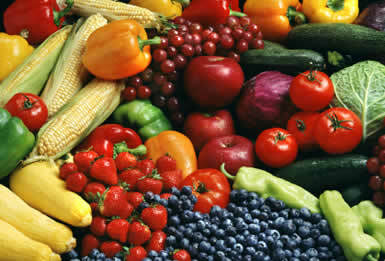 You can have the best defense system by eating a variety of fruits and vegetables daily.